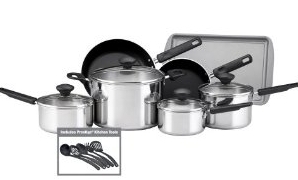 Target’s Deal of The Day today is a great price on a 16 pc set of Farberware Stainless Steel Cookware from the Classic Series. The price is shown as $52.24 down from $99 but once you put it in the cart it shows up as $47.02 with Free Shipping. If, by some chance it does not automatically reduce the price, try coupon code: URTYJLI8. I have had my Farberware set for 25 years and it’s just now that it needs to be replaced. This is good to hang onto for bridal shower gifts or Christmas presents.